We’ve been travelling around Asia the last several weeks and are back home getting settled into our normal routine. I always return from travelling changed in some way. This time it was a realization that I struggle with being content and patient. Travel exposes us to new cultures, cuisines, and landscapes and pries me out of my comfort zone, which is good! But I inevitably find myself missing familiar comforts from back home, like a long run in our neighborhood or a green smoothie. I also found myself getting antsy. My mind was spinning with business and content and recipe ideas and making grand plans for what project I could start the second we got home. The funny thing is, when I can’t work I want to work more than anything else. And when I’m not travelling I want to travel more than anything else. There seems to be a constant itch for “something else-ness.” I’m recognizing this about myself and trying to rest more in the balance – savor the present. Consider that a takeaway. Anyone else feel the same way with work/life/travel? OK, enough about me, let’s move onto wrapping up this lovely month! 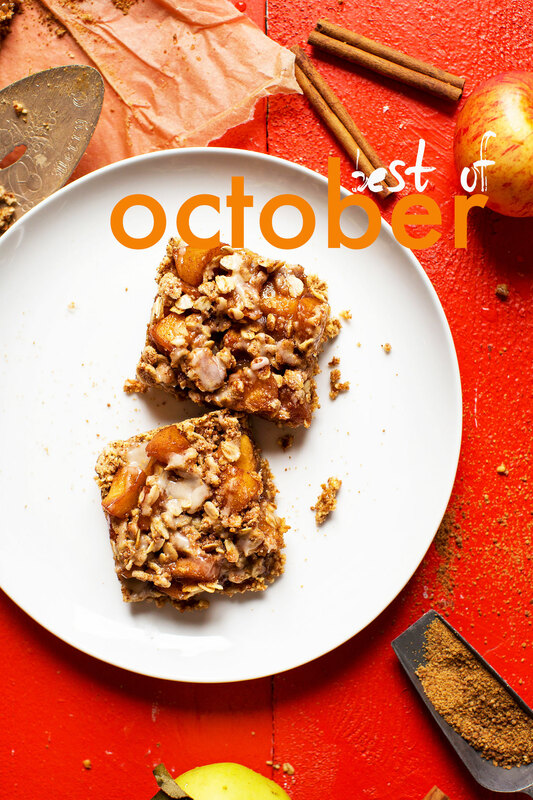 In this ‘best of’ installment I’m recapping everything we did and made in October, what we’re craving in November, and a hefty list of favorites from the month past. Shall we? Blogger Resources: As we are commonly asked what blogging tools we use, we updated our WordPress Plugins page and WordPress themes article. Both share the specific tools we use to design and operate this site as well as some of the theory behind our decisions. If you’re a blogger and want the latest resources tips, be sure to follow by email. We went to Japan, Seoul and Shanghai! Check out my and John’s Instagram accounts to see what we got up to. After hearing from many of you, I created an Asia Dining Guide for those of you hoping to make a similar trek. Enjoy! We published a few more recipe videos! Have you seen them? Subscribe to our YouTube channel to be updated on new ones as they come. Stay tuned for more! 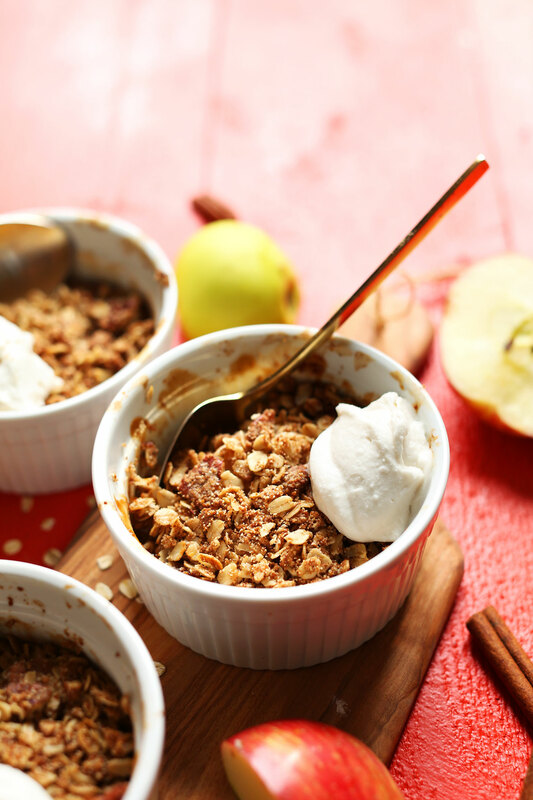 We shared another Bonus Recipe to our email subscribers: A healthified BREAKFAST Apple Crisp (pictured above)! Sign up now and you can still receive the recipe. Bonus recipes are FREE and shared exclusively with our email list every month in 2016. 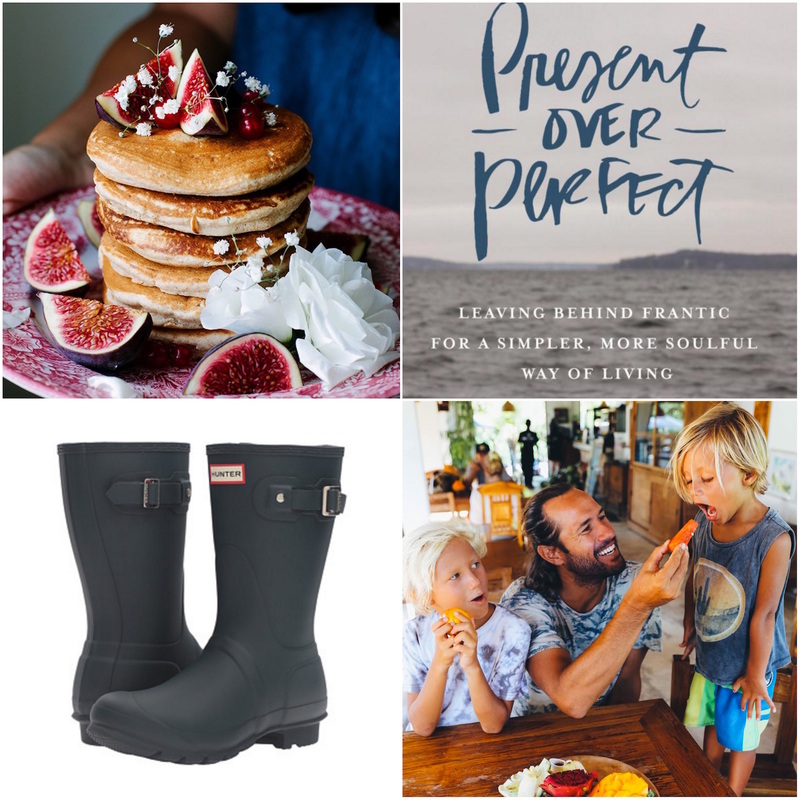 Read – I’ve been reading Shauna Niequist’s Present over Perfect. Shauna shares about finding balance in life and what self care looks like in a holistic sense. I’m lapping up every word. Follow – Earthy Andy is a new-to-me Instagram account by an adorable plant-based family living in Hawaii and travelling often. Expect dreamy photos and vegan recipes + tips. Cook – A blog I discovered this month was Wallflower Kitchen, which celebrates plant-based food with gorgeous photos + inventive recipes. The Fluffiest Vegan Pancakes are calling my name. Listen – Greg Laswell’s How the Day Sounds is my quintessential fall album. Wear – These Hunter Boots (short in navy) all winter long. Smell – I picked up this Amber oil perfume at Whole Foods recently and have been wearing it every day. I’ve also been lighting Nag Champa incense in our home for cozy, sandalwood feels. 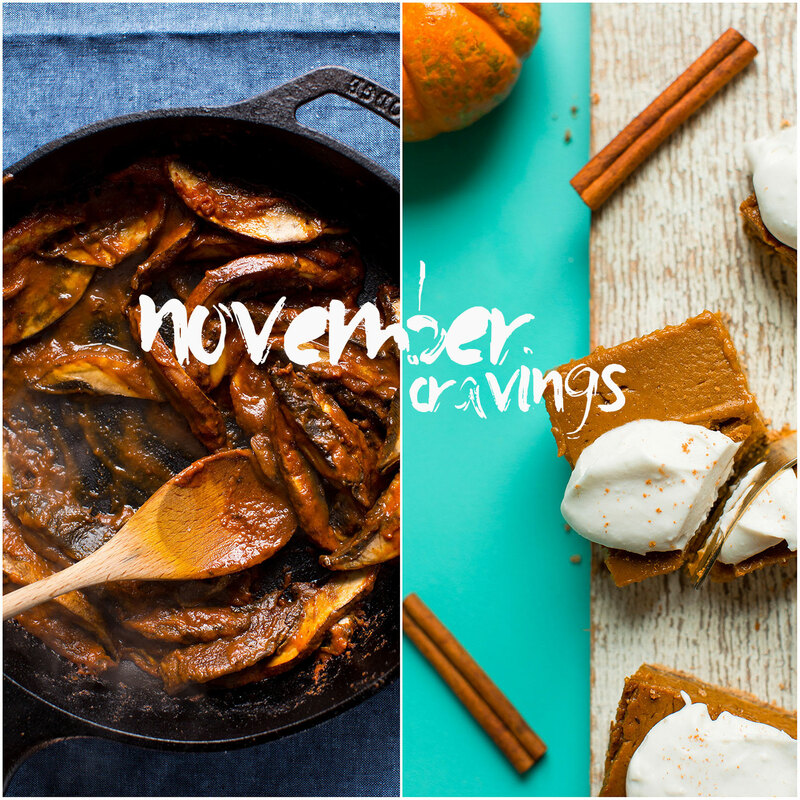 In November we’re craving ALL the cozy things, including comforting plant-based entrées and desserts, plus tons of Thanksgiving eats. Surprises are in store – stay tuned! See you back soon for plenty of deliciousness. Cheers, friends! So cool! I was just looking at a whole row of Bob Mill’s protein powder, they have so many other flavours ! Was contemplating whether to buy it. Thanks for the great reviews! OMG you travelled to Asia, my continent! I hope one day you’ll be able to visit my country Malaysia, we got tons of delicious local cuisine and some of them are vegan too. If you love santan (coconut milk) then you’ll be spoilt for choice! I made the Shakshuka and it was sooo hearty and good! Had enough left over to take to work for lunch. Outstanding! Loved it! I completely relate to the whole “something else-ness”, glad I am not alone!? Your blog is fantastic, thank you so much for all of your hard work. I am no vegan but your recipes are just so GOOD. I’m the same way! Can’t wait to read your Asian influenced recipes! Also, for the future look into water kefir grains when traveling. I’ve heard good things! I seem to always get sick when traveling… And am going to make sure to carry some on the next trip. I’m SO the same way when travelling…you spend so much time planning and then I suppose its hard to sit back and appreciate the moment (especially when you’re used to having your brain on the go-go) Thanks for sharing the lovely recap! I have got to make that chipotle aioli! Thank you SO much for the recap!! You’re awesome. This really helps if there’s emails lost in the shuffle. I’m in disbelief that you went to Asia and apparently did not eat any Asian food. There are so many traditional Chinese/Korean/Japanese dishes that are plant based but it seems like you went to Asia to eat in American style cafes and restaurants. John got food poisoning halfway through the trip and because of that we were no longer seeking out adventurous Asian cuisine, and rather comfort food that was familiar to us. Sorry you misunderstood! PS – Hope John is feeling better. Travelling is amazing in so many ways but we all have days where there’s no place like home. I’m so excited for November recipes!!!!!!! So excited for the Thanksgiving recipes! Now I want to eat those incredible looking Apple Pie Crumble Bars and go travelling in Asia. And thank you for sharing my pancakes – you have no idea how much that just completely made my day!